You can configure settings which affect how some of the SimplyFile commands work using the Options Window. Enable this option to have SimplyFile prompt you where you would like to file the message every time you send one. Disable this option if you prefer not to be prompted every time you send a message. If this option is OFF, the Send and File is the default button in the File Sent Message Window. Enable this option to make the Send, File And File Original the default button of that window. The default button of a window can be invoked by hitting the Enter, which is much faster than clicking it with a mouse. Enable this option to file messages in both the folder you specify and Sent Items. Enable this option to have SimplyFile not display its prompt to file automatically sent messages, such as auto-replies, mail-merge, etc. Enable this option to have SimplyFile mark messages as read when they are filed. 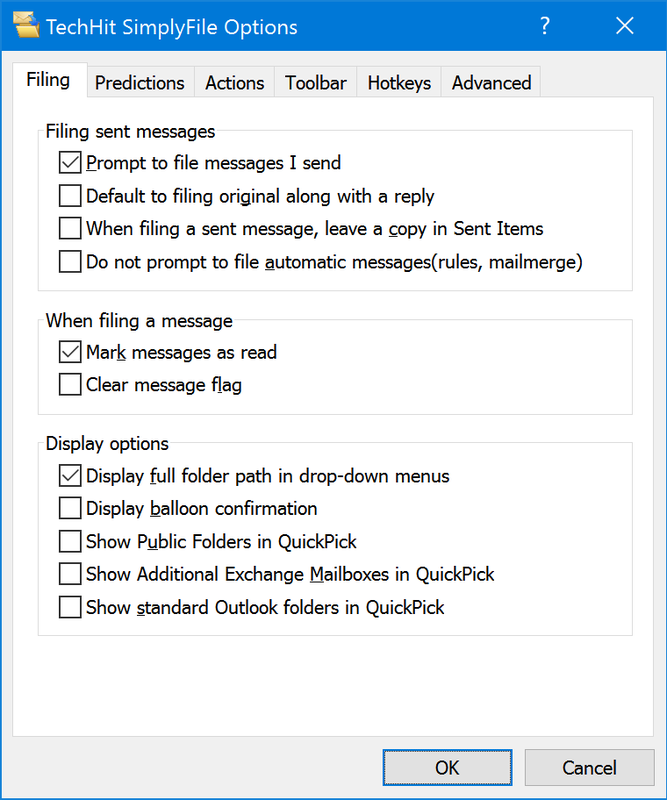 Enable this option to have SimplyFile clear flags on messages as they are filed. SimplyFile will also remove “reminder” properties set by SnoozeIt. If you have several folders with the same name in different locations, you can enable this option to have SimplyFile display full path in drop-downs, such as File In or right-click menus. If this option is enabled, SimplyFile will briefly display a balloon notification about each filed message. Enable this option to include all Public Folders in the list of folders shown in the QuickPick Window. If you are not using Public Folders, disable this option for a small performance increase. Enable this option to include folders from additional Microsoft Exchange mailboxes you access in Outlook in the QuickPick Window. Additional mailboxes include your Online Archive and mailboxes of your coworkers who gave you access to their mailboxes. 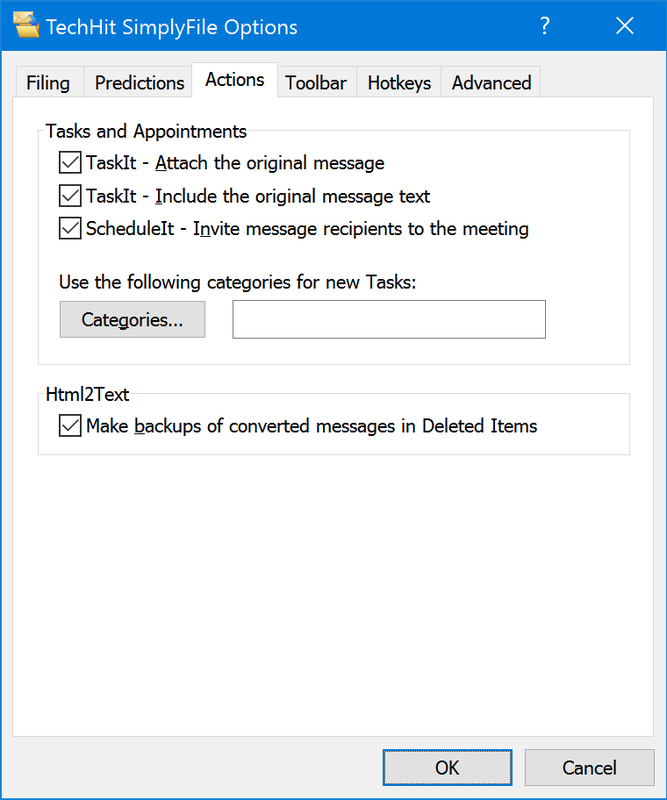 Enable to have standard Outlook folders, such as Deleted Items, Contacts, Tasks, Outbox, etc. shown in QuickPick. 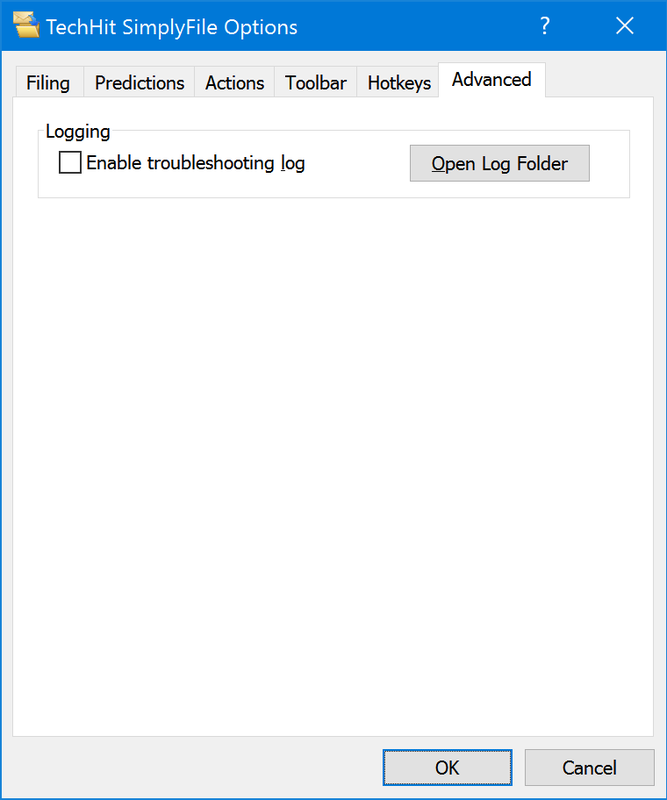 Controls how SimplyFile generates folder predictions. Default and recommended option. Uses a combination of message attributes for folder suggestions. Give more weight to message content when making folder suggestions. 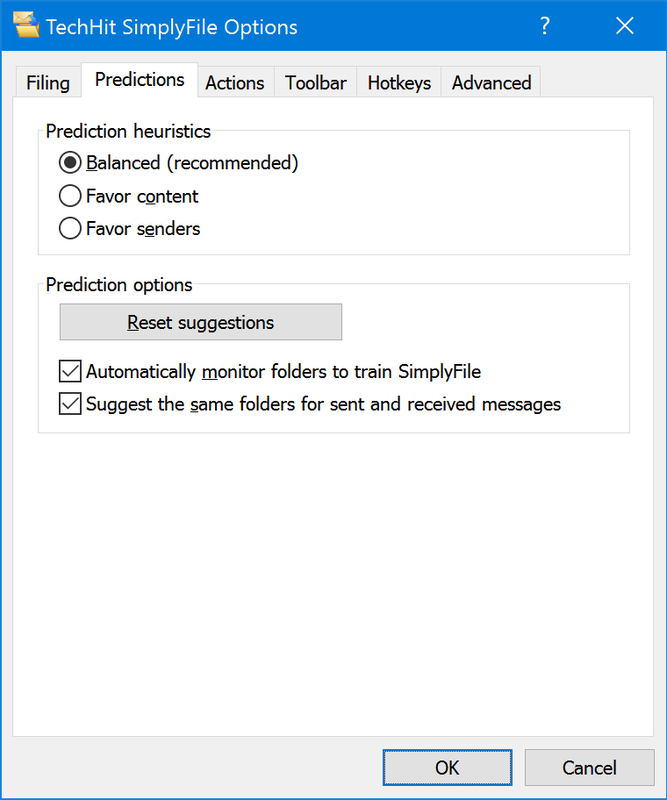 Give more weight to sender and recipient information when making predictions. This button resets SimplyFile folder suggestion data. You will want to do this every time you re-organize your Outlook folder structure or change account configuration. After you clear your filing history, use the Train SimplyFile command to quickly get SimplyFile folder suggestion engine up-to-speed on your new folder structure. If this option is enabled, SimplyFile will train itself in the background. Even if this option is OFF, SimplyFile will still train every time you use it to file a message. This option will turn off after you manually run Train SimplyFile. Disable this option if you use different folders for sent and received messages and would like SimplyFile to learn about them separately. Most users will want to keep this ON. Enable this option to have the Html2Text command make a backup copy of the original message in the Deleted Items folder. Use this Tab to control which buttons are displayed on the SimplyFile toolbar. If you are not using a particular command, you can uncheck it to hide its button and save some space on the toolbar. 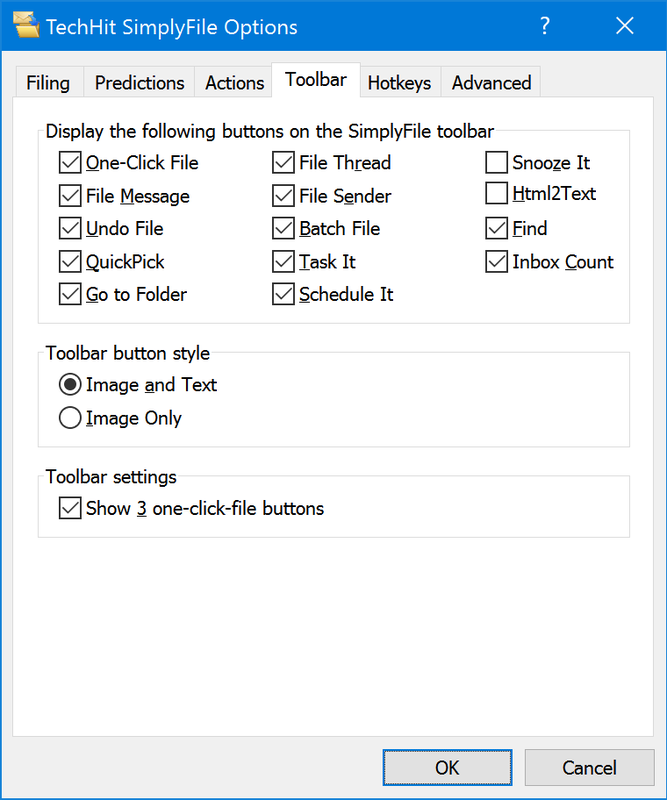 This option controls whether SimplyFile shows one or three One Click File Buttons. 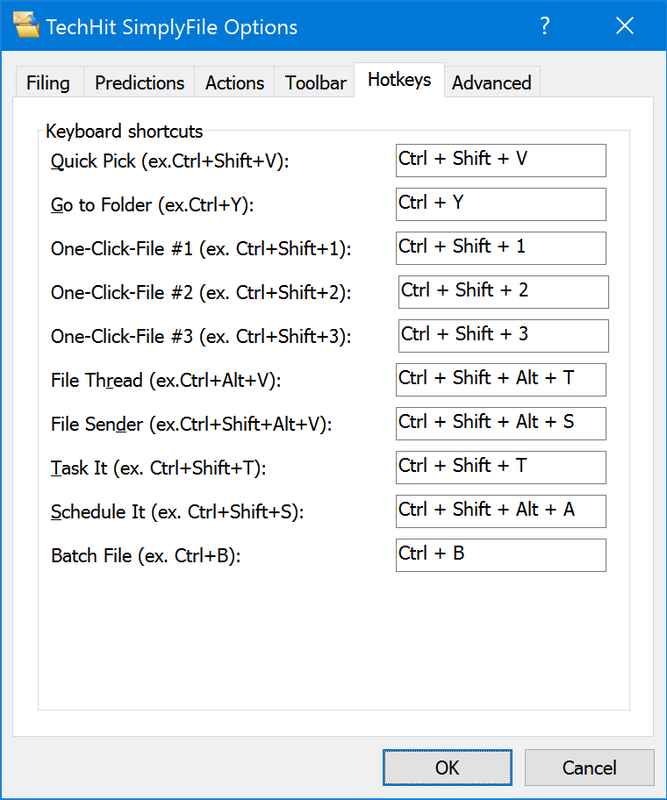 Use this tab to configure keyboard shortcuts (hotkeys) for SimplyFile functions. Hotkeys is an excellent way to make your SimplyFile usage even faster by eliminating the need to reach for the mouse in most cases. Hotkeys along with the QuickPick Window make SimplyFile perfectly optimized for fast keyboard-based operation.